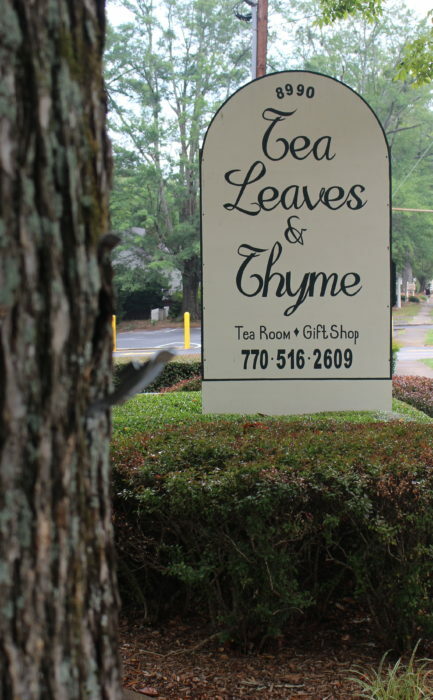 I recently had the pleasure of visiting a tea room in historic Woodstock, GA which is a bit north of Atlanta, called Tea Leaves and Thyme. They are on Main Street in this cozy house turned restaurant. These are the first tables you see right by the windows on the front porch. 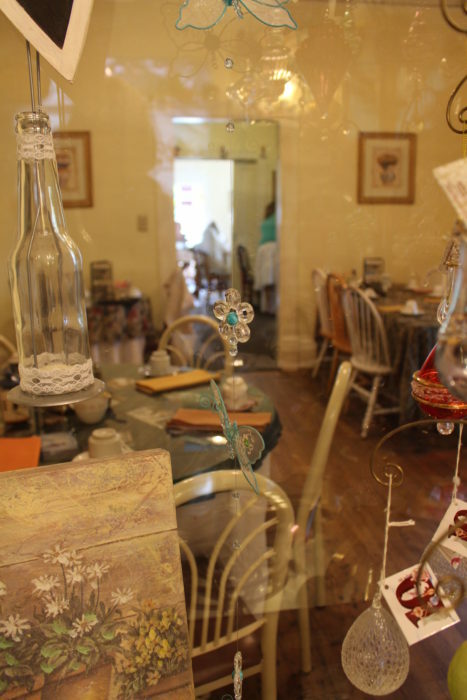 And here’s a view of some of the interior dining rooms looking from the gift shop. We had a nice welcome when we sat down at our table. 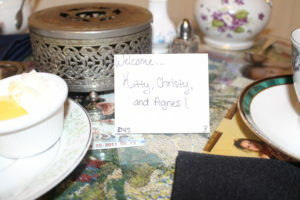 It’s always the little touches that make it special. We opted for the Classic Afternoon Tea. 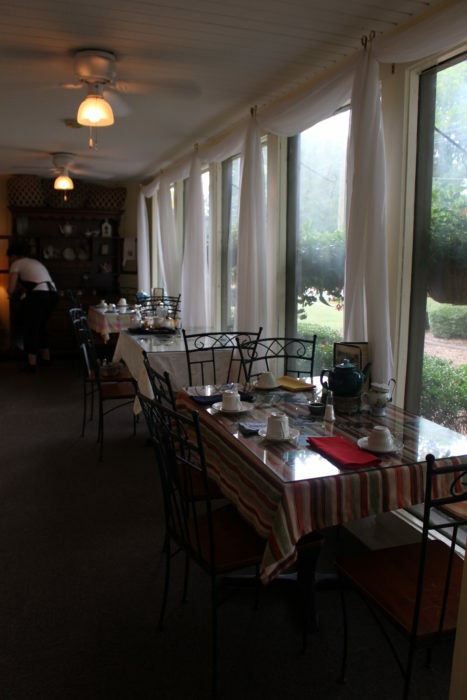 It is priced very reasonably at $16.50 per person for the full tea experience. Their tea menu was very extensive – 4 pages to choose from! 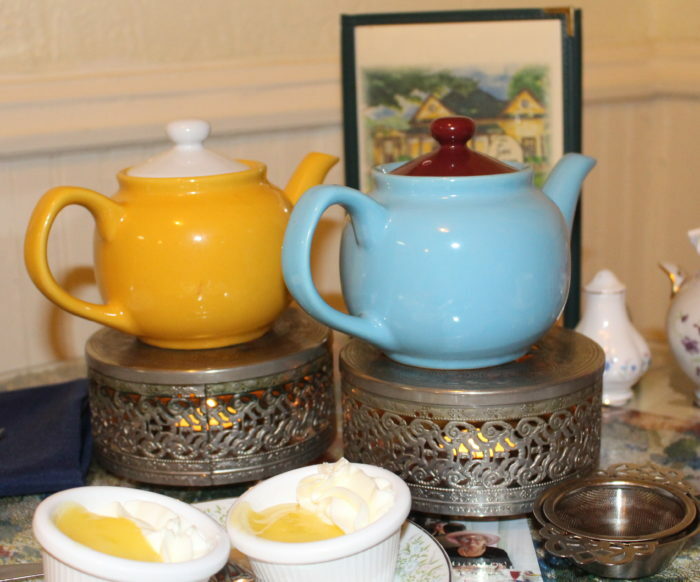 You can choose from black, oolong, green, white, flavored, scented, chai, rooibos, and herbal infusions. They even had single estate teas which just tells you they’re offering very high quality teas. 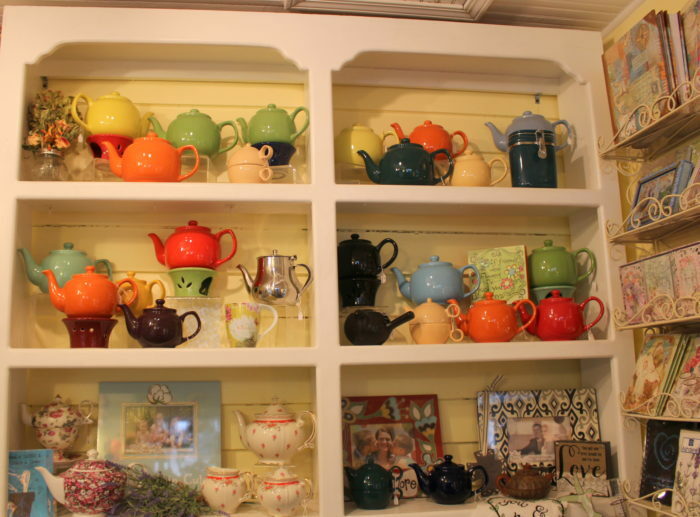 Plus they have bottomless tea pots so you can try as many teas as you like until you float. We did! They offered honey or sugar cubes for sweeteners and cream if you wanted. 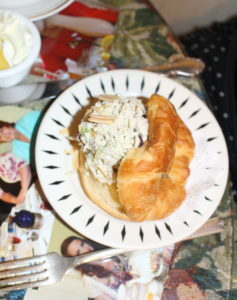 We started with a tomato tartlet with a crust that had a nice cornbread texture and house-made chicken salad on a flaky croissant. 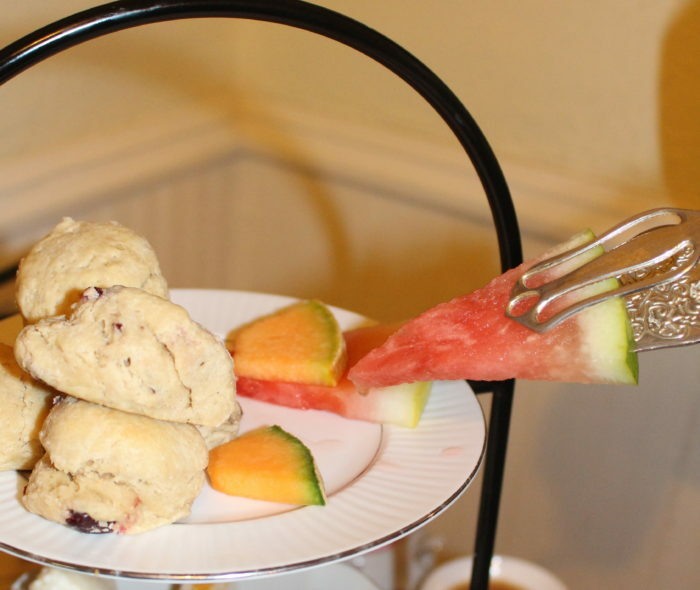 Then they bring the three tiered tray full of scones, sandwiches, desserts, savories and a pot of tea. 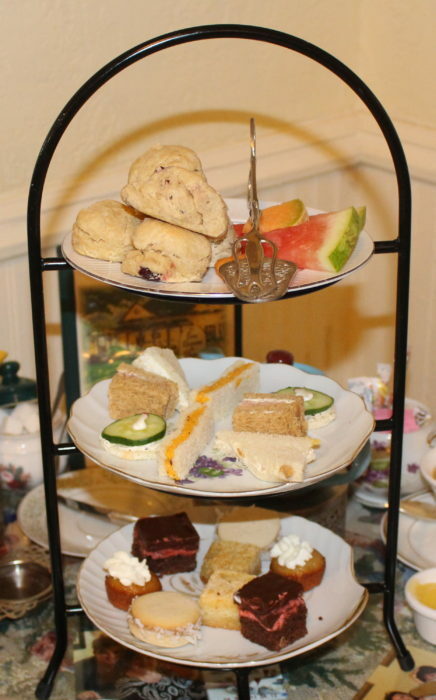 They called this a “light afternoon tea tray” on their menu. It’s beautiful, tasty and very filling; however, I would not use the word “light” to describe this. Nope, not at all. 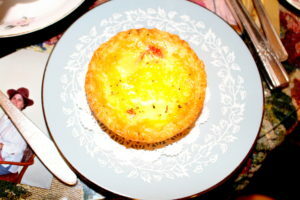 The scones were delightful, especially topped with the clotted cream and lemon curd. It was summer time and we enjoyed the fresh watermelon and cantaloupe slices. We gobbled down the little sandwiches but I paused long enough to admire the radish garnish on top of the cucumber sandwiches. Another nice little touch showing their chef’s attention to detail. We were slowing down by the time we made it down to the desserts but we managed somehow. The raspberry chocolate cake bites were a bit dry but the lemon squares were wonderfully chewy however I believe the shortbread cookies were my favorite. 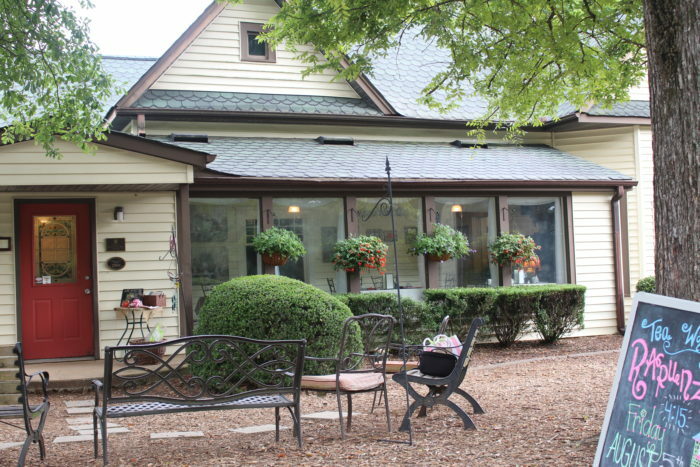 Although the tea was fine, the food surpassed it but the best part was the skilled service. Truly excellent and I complimented the owner on her staff. 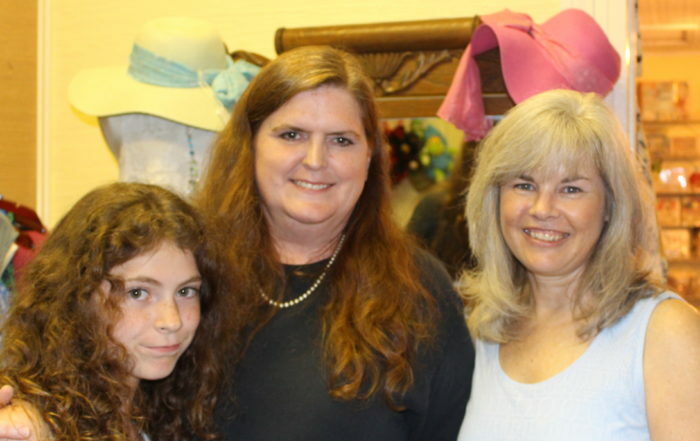 Afterwards we browsed through the well-stocked gift shop. You can buy some of their tea and take it home with you. Of course I did. I had a wonderful day with my third or fourth cousin (depending on how you count it) and her daughter and I truly enjoyed the time to catch up. We were very daring and broke the rules of polite conversation and consciously hit all the forbidden topics: politics, religion, and money. It was an intriguing, lively conversation with a variety of viewpoints and I enjoyed it very much. Exactly the cultured event one wants for an afternoon tea. That looks lovely! Looks like it had the perfect atmosphere! What tea did you bring home? Kitty, my daughter and I are searching for lose leaf Earl Gray, without having to order it online. Do you know of anywhere in or around Huntsville? Try Piper & Leaf’s Front Porch Special. It’s their version of Earl Grey. The Kaffeeklatsch downtown has Earl Grey too. 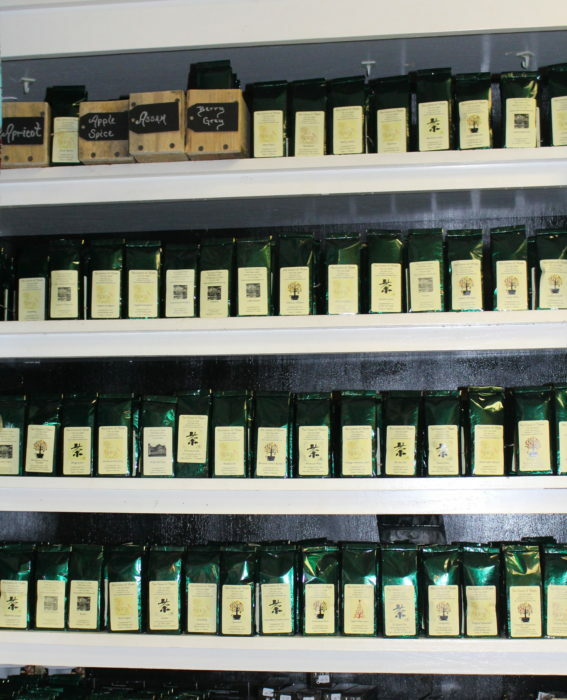 Also, if you’re in Harrison Brothers they carry some of the Elmwood Teas which are exquisite. I don’t know if they have an Earl Grey right now but you have a few options! Let me know what you find. Cheers to you and your daughter!